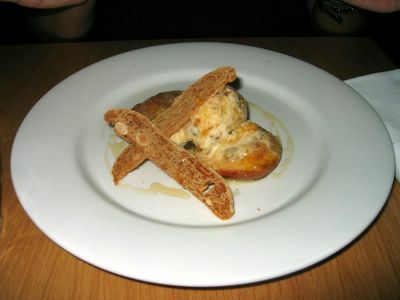 On Friday, we went to bills cafe for lunch, and had been planning on going to Kylie Kwong's restaurant for dinner. However, they don't take bookings, and when we arrived, we were informed that it would be a 1.5 hour wait for a table! We didn't want to wait, so we just went next door to bills 2. This was the one that I visited the last time I came to Sydney, and it's been refurbished since then. Previously, it had a slightly industrial look - all polished steel benches. But now it's a lot softer and warmer, with wooden benches and softer coloured chairs. I quite like it. 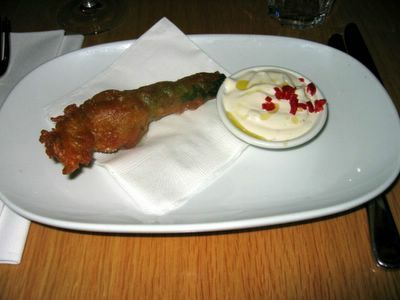 To start, I had a deep-fried zucchini flower with a garlic yogurt. Yum! This is one of my fave things to eat, but they can be hard to find. And it was only $3.50! 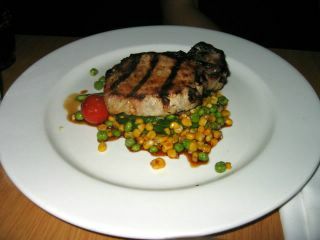 Maple-glazed pork loin with asparagus, peas, broadbeans and corn. There weren't any broadbeans in it though, only cherry tomatoes. 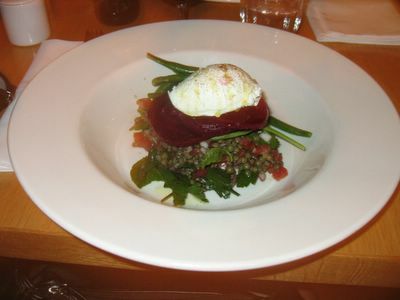 I had a baby lentil salad with beetroot, green beans, and goat's curd. And for dessert, An had seasonal stone fruit roast with almonds, Ligurian honey and served with brittle ice-cream. It looked great, but was very, very sweet. 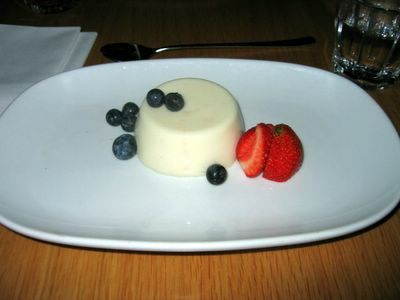 I had the cheapest dessert on the menu, a buttermilk pannacotta with a few berries. It was light and refreshing, and beautiful! Bill twice in one day? I must be dreaming. I thought deep-fried zucchini flowers were everywhere! You can often get them at the Good Living Growers Market but I'm not sure I spotted any last week.